The first thing you notice about Pau is the location. In the Pyrénées-Atlantiques department of the new huge region of Nouvelle Aquitaine, the city is surrounded by beautiful mountains. From here it’s a short drive through the spectacular National Pyrenees Park to the border with Spain and just 125 km (77 miles) or around a 90-minute drive from the top seaside resort of Biarritz on the Atlantic Coast. Pau became the capital of the kingdom on Navarre in 1512. Its royal status was secured through Henry of Bourbon. Born in Pau Castle, he became King of France in 1589. Three centuries later Pau was discovered by a Scottish doctor, Alexander Taylor, who announced it as the place for cures of all kinds of ailments due to the great oceanic climate, warm and wet in the winter, and just delightfully warm in the summer. The English followed the somewhat dubious doctor’s recommendation and in the 19th century, flocked here, bringing with them all the English past times: horse racing, croquet, cricket, and fox-hunting. The first 18-hole golf course in Europe was built here in 1860, and it was also the first to admit women to its range. The building of the railways brought other nations to this city beside the mountains while the French found Pau just as attractive. 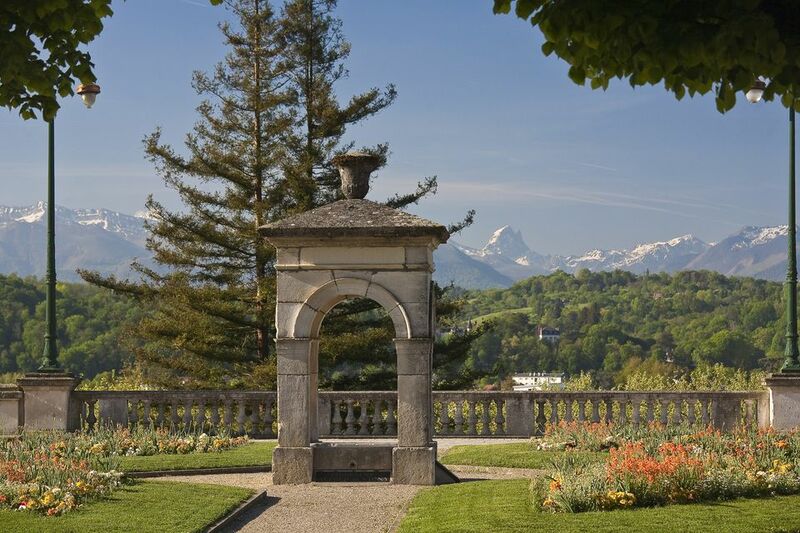 Pau became the most fashionable resort in western Europe and remained so up until 1914. In 1908, the Wright brothers arrived in Pau to create the first pilot’s school in the world. Almost all the major pilots in World War I trained here in the five schools around the city. The central old part of Pau is pedestrianized, so it’s a pleasant, relaxed city to walk around. The Boulevard de Pyrénées makes the best starting point with views to the country on one side and the majestic mountains on the other. There’s plenty of good shopping in the République quarter, both shopping malls and individual boutiques. Only a small part remains of the original keep built in 1370. The building was thoroughly taken over by Louis-Philippe and Napoleon III in the 19th century and well renovated. There are only French guided tours, but even if you don’t understand much, it’s worth going in for the splendid interiors and series of Gobelin tapestries hung on the walls to impress past guests and keep the place warm. And you can wander the magnificent gardens for free. The thoroughly ordinary soldier Jean-Baptiste Bernadotte was born here. You can see the story of how he fought in Napoleon’s armies, became Maréchal and ended up as King Charles XI of Sweden in the rooms here. The Musée National des Parachutistes features exhibits devoted to the history of parachuting, particularly dealing with the military. Pau-Pyrénées airport is served by other French cities and some European destinations, so to get here, you will have to fly from Paris, Lyon, Marseille or other French cities. There is an hourly shuttle bus from the airport into the center of Pau. A taxi into town costs around 30 euros. At a weekend you should book a taxi in advance. There is a direct train to and from Paris. The modern Hotel Parc Beaumont is the best hotel in Pau with top amenities and a pool. Splash out on a room with a view of the mountains. The Bristol, converted from a 19th-century villa, is a comfortable and central 3-star hotel with a terrace. The 2-star Hotel Montilleul is a modest and cheap option outside the main center of town. Comfortable rooms and free parking. The Hotel Roncevaux is a former monastery converted into a comfortable hotel. La Brasserie Royale is a top brasserie with a good value, traditional menu. There’s also a terrace for outdoor dining. Les Papilles Insolites is half restaurant, half wine bar and very good. Choose from a large selection and eat in the intimate dining room.